Maeonius (d. 266/267), or Maconius, was a short-lived Roman usurper. He was the nephew (according to Zonaras xii.24) or the cousin (according to Historia Augusta, which lists him among the Thirty Tyrants) of Odaenathus of Palmyra, who had taken control of the Eastern provinces after the defeat and capture of Emperor Valerian by Shapur I of the Sassanid Empire. According to Historia Augusta, Maeonius killed Odaenathus and his son Hairan during a celebration, because of a conspiracy organized by Zenobia, wife of Odaenathus, who wanted her sons to succeed her husband instead of Hairan (who was the son of Odaenathus by another woman). According to Gibbon, the murder was revenge for a short confinement imposed on Maeonius by Odaenathus for being unrespectful. Zonaras tells that Maeonius was killed immediately after the murder of Odaenathus, while Historia has Maeonius proclaiming himself emperor, with Zenobia having had him soon killed, in order to take the power for herself. Gibbon, Edward, The Decline And Fall Of The Roman Empire, "Chapter XI: Reign Of Claudius, Defeat Of The Goths. -- Part III." Gallienus, also known as Gallien, was Roman Emperor with his father Valerian from 22 October 253 to spring 260 and alone from spring 260 to September 268. He ruled during the Crisis of the Third Century that nearly caused the collapse of the empire. While he won a number of military victories, he was unable to prevent the secession of important provinces. His 15-year reign was the longest since the 19-year rule of Caracalla. Probus, was Roman Emperor from 276 to 282. Probus was an active and successful general as well as a conscientious administrator, and in his reign of six years he secured prosperity for the inner provinces while withstanding repeated inundations of hostile barbarian tribes on almost every sector of the frontier. Carus was Roman Emperor from 282 to 283, and was 60 at ascension. During his short reign, Carus fought the Germanic tribes and Sarmatians along the Danube frontier with success. Quintillus was Roman Emperor for a few months in 270. 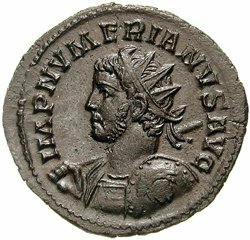 Fulvius Macrianus, also called Macrianus Major, was a Roman usurper. He was one of Valerian's fiscal officers. More precisely, sources refer to him as being in charge of the whole state accounts or, in the language of a later age, as Count of the Treasury and the person in charge of markets and provisions. It seems almost certain that he was an Equestrian. The Historia Augusta claims that he was the foremost of Valerian's military commanders, but that is most likely a gross exaggeration, if not entirely fictitious. Titus Fulvius Junius Quietus was a Roman usurper against Roman Emperor Gallienus. Septimius Udhayna, Latinized as Odaenathus, was the founder king (Mlk) of the Palmyrene Kingdom centered at Palmyra, Syria. He lifted his city from the position of a regional center subordinate to Rome into the supreme power in the East. Odaenathus was born into an aristocratic Palmyrene family that received Roman citizenship in the 190s under the Severan dynasty. He was the son of Hairan the descendant of Nasor. The circumstances surrounding his rise are ambiguous; he became the lord (Ras) of the city, a position created for him, as early as the 240s and by 258, he was styled a consularis, indicating a high status in the Roman Empire. Lucius Julius Aurelius Septimius Vaballathus Athenodorus c. 259–74 AD) was emperor of the Palmyrene Empire centered at Palmyra in the region of Syria. He came to power as a child under his regent mother Zenobia, who led a revolt against the Roman Empire and formed the independent Palmyrene Empire. Septimius Herodianus or Hairan was the son and co-king of Odaenathus of Palmyra. Through his father's marriage to Zenobia, Hairan had a half brother with the same name Hairan II.